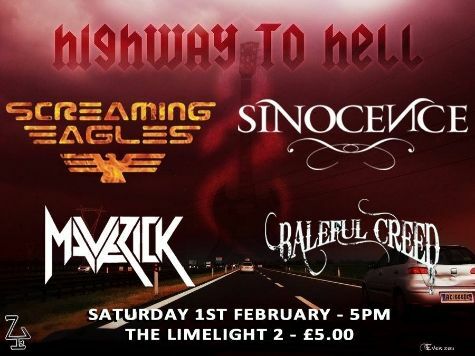 Three of the four bands that represented Northern Ireland at the Highway to Hell competition in Glasgow last year came together to perform at a Distortion Project gig in Limelight 2, Belfast on 1st February 2014. Unfortunately, Sinocence (who had won a place at the Hannerfest VI festival in March 2014) had to pull out due to an injury. However, Baleful Creed, Maverick and overall competition winners Screaming Eagles (they played the Hard Rock Hell festival in Wales) put a great show for the considerable number of fans who attended. Check out a video of each of the bands.